Read below to find out what other happy couples have shared about their experiences! "After months of researching and speaking with different photographers, I chose Grace based on how responsive and incredibly professional and talented she is. She took time and care to ask all the right questions to assure she'll capture exactly what what's important to us. She's so nice and easy to work with, my then fiancé (now husband) and I are very camera shy and Grace made us feel very at ease when she shot our engagement shoot. I'm so obsessed with my wedding pictures, as are our friends and family. Everyone says they look like they are straight out of a magazine! Planning a wedding is very difficult, but rest assured Grace will make you feel loved and treat you like the special bride you are." "Grace was our photographer for our wedding this August in Santa Barbara at the Historical Museum. Long before we were engaged I had found Grace's work online after searching around for inspiration. We reached out to a couple other photographers for comparison and I always kept coming back to Grace's website because her work is truly so beautiful! After I connected with Grace over the phone I knew without a doubt she was the one for the job. Not only is Grace extremely talented, but she's so friendly, down to earth, easy going and makes it a point to understand you as a couple and the overall themes we wanted to show on our big day. We talked to a handful of other photographers that were far too expensive and were nowhere near as friendly and open as Grace was. It's been 4 months since our wedding now, and I still pull up our photos in amazement. They are beautifully captured, lighting is gorgeous and they are so many details I will cherish forever. Sounds cheesy, but Grace is the best kept secret in Santa Barbara when it comes to talent!" 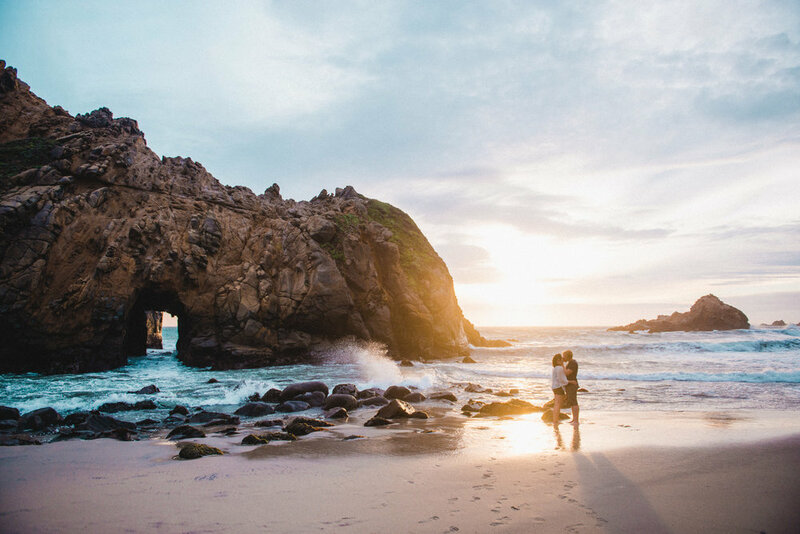 "Grace was the photographer for our engagement photos in Big Sur, California, and was also the photographer at our destination wedding in Costa Rica. As an actress, I have had the opportunity to work with many professional photographers, but none as charming and genuine as Grace. She has a unique ability to set her subjects at ease, reminding them to get lost in one another and truly enjoy the moment. At first, I didn't think an engagement shoot was necessary, but I'm so glad we did one because it was one of those moments of pure enjoyment during our engagement! I look back with joy at the good times with my family and friends at our engagement party, bridal shower, Big Sur engagement shoot, and destination wedding. Thank you Grace, for making our shoot so special." "I don't even know where to start describing my experience with Grace... From the minute my husband and I met her, we knew we made the right choice! She is incredibly sweet, friendly, and personable -- yet extremely professional and responsive! When my husband and I were looking for a photographer to hire, we wanted a specific style: something very soft, romantic, and contemporary. There is nothing we dislike more than the old fashioned and cheesy poses. After browsing through Grace's portfolio online and chatting with her in person, we knew that her style is exactly what we wanted! She is very open-minded, she knows how to "read" a couple and she WILL capture the sweetest, most precious moments! Thank you so much Grace for all the wonderful work you did and most importantly, for the amazing experience you've created!" "Grace has a true passion and talent for what she does and it's immediately apparent from the moment you meet her. She was incredibly easy to work with and on the day of, and made us feel so comfortable that it almost felt like a close friend was shooting our wedding. I wanted pictures with my dog and she was more than happy to deal with an excited pup. Just two weeks after the wedding, she provided us with a wedding preview and we LOVE THEM. She and her second shooter did an amazing job capturing the emotions and excitement of the day. From the ceremony shots to the dance floor, Grace memorialized it all."